Hydraulic Sample Extruder - Gilson Co.
HM-524 Hydraulic Sample Extruder (115V/60Hz) ejects undisturbed soil samples from full size thin-walled samplers (Shelby Tubes) in one stroke. It is used in sample preparation for a variety of soil tests including triaxial, permeability, direct shear, consolidation, unconfined compression and more. The bench-top extruder is set up for 3in (76mm) diameter tubes of 30in or 36in (762mm or 914mm) length, but can also process 2in (51mm) diameter tubes with the optional HMA-282 2in Sample Adapter. The smooth, easily controlled piston stroke permits easy handling and rapid processing of samples. 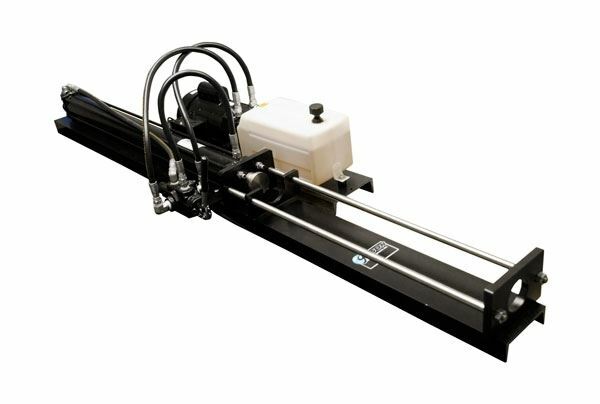 The extruder can apply up to 5,600lbf (24.9kN) of force to eject even stubborn samples. The hydraulic system precisely controls the horizontally mounted piston. The HM-524 unit comes with a sample receiving trough to ensure minimal disturbance while ejecting and logging sample. The 1.7gpm (6.4lpm) hydraulic pump is powered by a 1hp electric motor and the hydraulic oil reservoir has a 2.5gal (47L) capacity.